Salty + sweet = perfection, in my book. Add Christmas sprinkles and mint M&M’s… it’s a done deal, folks. This is one of my favorite treats to make. It literally takes minutes, and makes a sweet gift for a friend or teacher, co-worker or neighbor. Or you can shovel it in by the handful. I’ll never tell. Pop the popcorn as directed (we love making ours in an airpop microwave bowl!) Pour popped corn onto a large rimmed cookie sheet. Remove as many un-popped kernels as you can, then pour popcorn into large bowl. 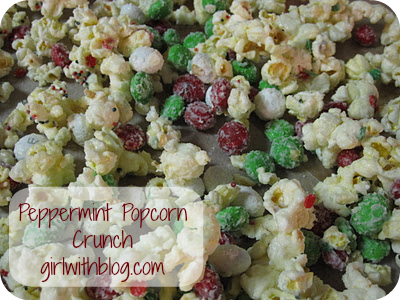 Add the mint M&M’s to taste (I usually use about a bag and a half) and Christmas sprinkles. Toss everything together (again, with your hands!) Spread the mixture out on wax paper and leave it until it’s cool and not melty anymore. If you’re feeling generous, put a scoop of popcorn in a little bag, tie with a ribbon and bring to a friend. But if you eat the whole batch yourself, I won’t judge. Either way, enjoy! *If you find and use peppermint candy melts instead of vanilla melts, omit the peppermint extract. You really do. It’s SO good!